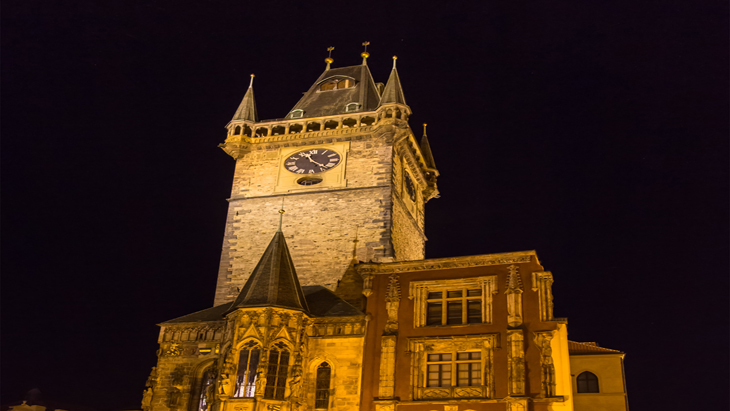 Prague’s first town hall was built during the reign of King John of Luxembourg (1310-46). The citizens chose to use existing structures but added to them, including the Gothic oriel window that survives today, and the tower. Neighbouring structures were incorporated into the town, including the sgrafitto-covered House at the Minute (Dům U minuty), at the junction with Malé náměstí. The Old Town Hall was once much bigger, and the Neo-Gothic east wing stretched round the corner towards St Nicholas Church. This section of the building was not rebuilt after 8 May 1945, when the Nazis, in a last, desperate effort, set fire to the Old Town Hall. Ironically, the Old Town Hall, which is synonymous with Prague, was one of its very few buildings to be destroyed in World War II. The only surviving section of the Neo-Gothic wing can still be seen close to the oriel window of the chapel. On the pavement opposite the chapel window are 27 white crosses made of stone and commemorating the Protestant leaders who were executed following the Battle of White Mountain in 1620. Twenty-four of them were beheaded and the other three were hung, drawn and quartered. Today, the Old Town Hall is an important stop-off point for tourists. It contains an information centre, and the space adjacent to it hosts regular exhibitions. Visitors can also climb the tower (separate entrance) and see the workings of the famous Astronomical Clock.